Are you feeling heavy? Bloated? 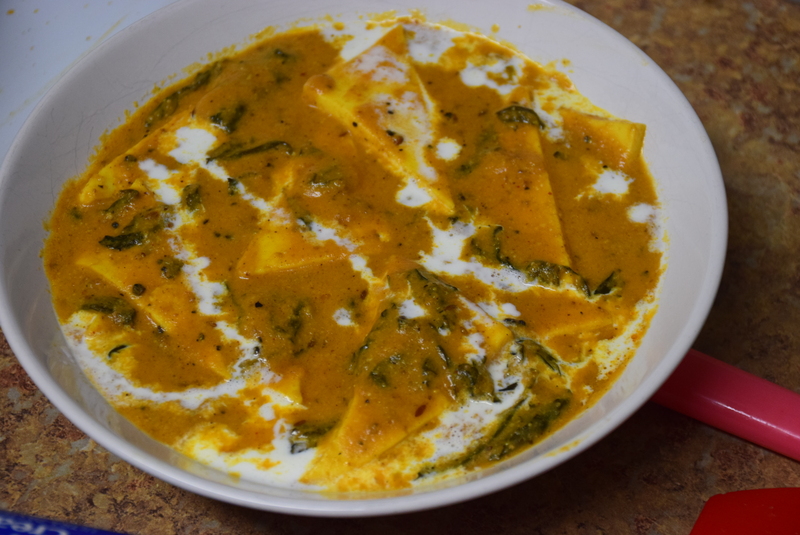 Why not include Methi (Fenugreek) in your today’s menu ! 😛 Jokes apart, Fenugreek leaves are not only good for detoxification, they also give you the essential proteins, fibres , HDL Cholestrol etc. They are good to get rid of blemishes and skin rashes , diabetes and support long ,lustrous hair. Formerly, I have shared this recipe with onions. But I wanted to try it without onion-garlic, so this is my Satvik version of the same. This year I have included at least one green in my daily diet. Since paneer is rich in proteins and fats, this dish in whole is a health-bonus. Moreover, my daughter relishes it . So let’s check this delicious recipe now..
1. 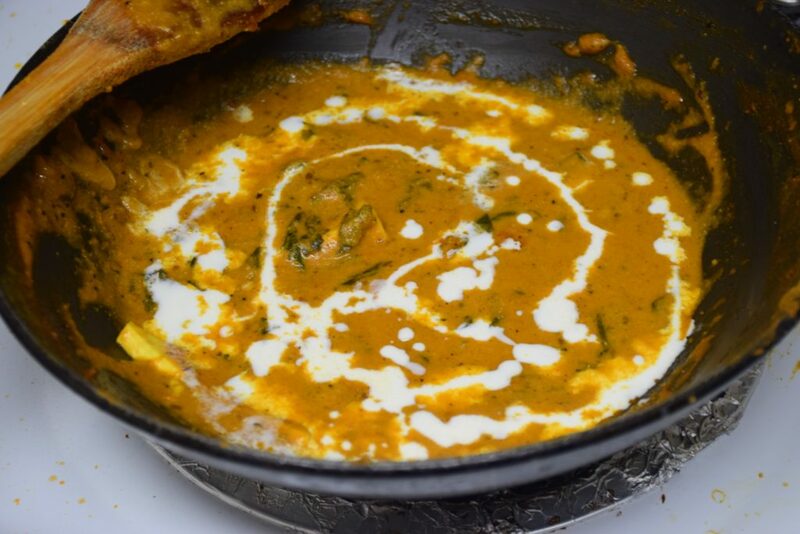 We begin with preparing the curry or gravy for this dish first. 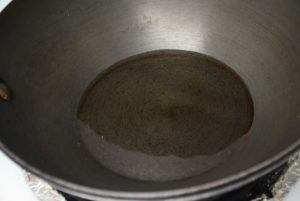 For this heat as much as 4 cups of water or more and bring it to a boil in a pan. 2. 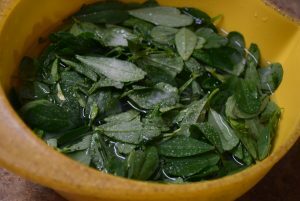 In the meanwhile, soak the washed( I wash it at least 4 to 5 times or till I don’t see any dirt floating in water) , plucked methi(It is essential to separate the leaves from the stems) in water with 1 tsp salt . (Soaking in salty water helps in reducing their bitterness.But I have made without soaking and it tasted good too.) 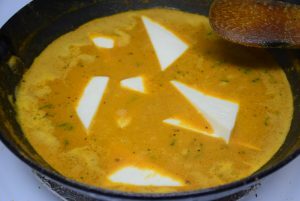 Also cut the paneer in desired shapes. I sliced it in big triangles this time for a change. 3. 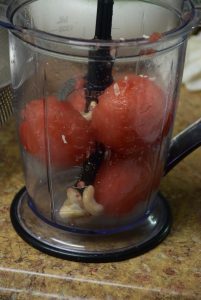 When the water starts boiling , add the washed tomatoes (with their eyes removed) , the ginger (washed and peeled) and the cashews in it. This process not only gives the perfect red color to the gravy, it also is healthy and clean way of removing the peels of tomatoes. Plus it nullifies the rawness and uneven texture of the gravy. The restaurant owners in India usually boil the onions, tomatoes in oil which although looks fancy, but does not taste better than this. 4. Next is, we will dry roast the whole spices involved with poppy seeds and almond flour in the end. So for this, take a non-stick pan /wok (kadhai) and add laung, badi elaichi, tej patta, sabut dhania, chhoti elaichi,dalchini in it on medium heat. Stir them continously till they smell aromatic and change slight color. 7. 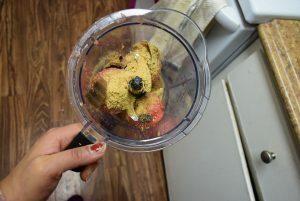 Now add the roasted spices, flour and boiled ingredients in a jar/mixer/blender and puree all till you get a fine paste. 8. 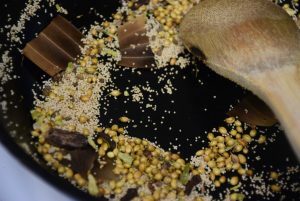 While the ingredients are blending, squeeze Methi from the saline water and add it to the heated wok containing oil. Roast methi on medium heat in oil till it withers and shrink in size or till all the water evaporates. 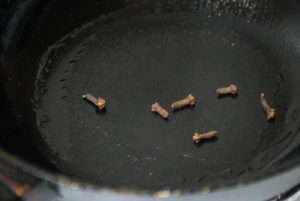 Once done, remove the roasted methi in a plate. 9. 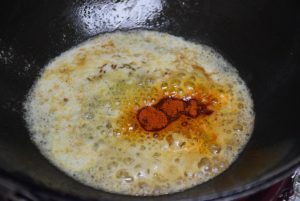 In the same wok(kadhai) , now add Amul butter on high heat. 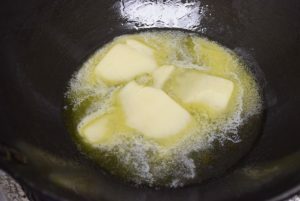 Once the butter starts melting, add jeera and hing to it. Also add soonth and stir them well. 10. 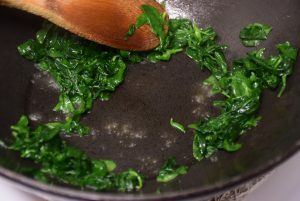 Lower the heat and add the puree just made to the wok. 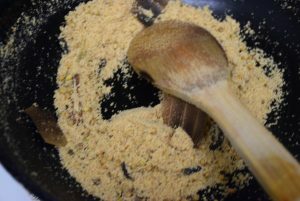 Also add kashmiri lal mirch powder and keep on stirring till all is mixed. Let it boil for 2 mins on medium to low heat. 11. Now add the powdered spices viz. 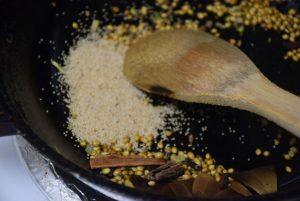 coriander powder, fennel powder,turmeric, salt and curry powder . 12. 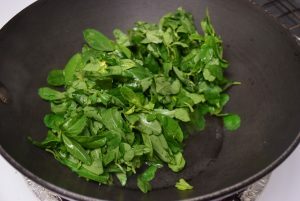 Then add the roasted methi leaves and stir them in the gravy. Also add little water/milk if the mixture dries out. 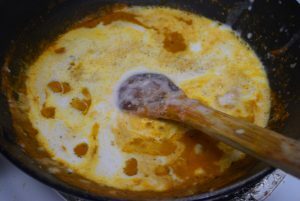 (Adjust the thickness of the curry by adding water or warm milk as per your preferred consistency. We usually like thick creamy pouring consistency.) Bring it to a quick boil again. 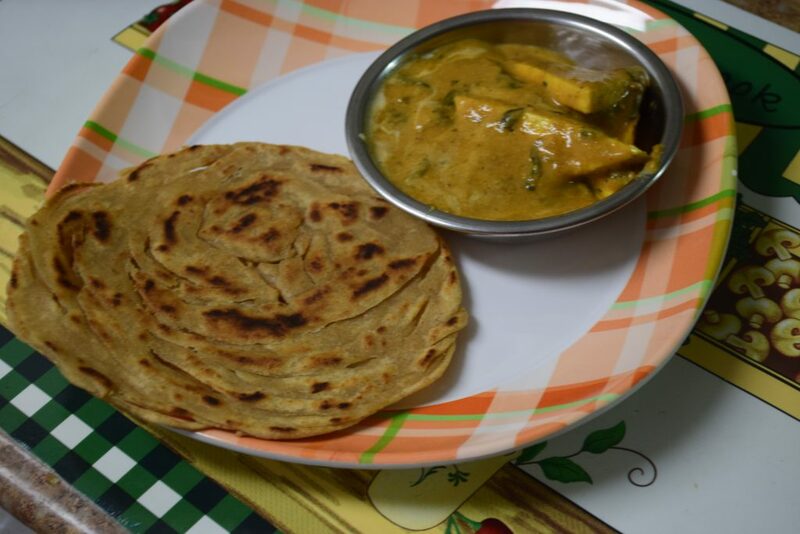 Serve the curry hot with Lachchha paranthas or roti. Enjoy your dinner with your loved ones. 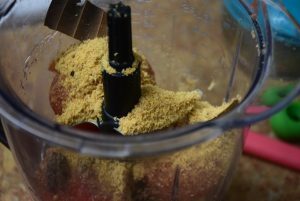 Hope you like this recipe and give it a shot. Or if you have some valuable suggestions, please comment below. Are you feeling heavy? Bloated? 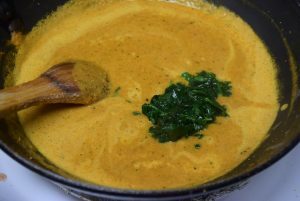 Why not include Methi (Fenugreek) in your today's menu ! 😛 Jokes apart, Fenugreek leaves are not only good for detoxification, they also give you the essential proteins, fibres , HDL Cholestrol etc. They are good to get rid of blemishes and skin rashes , diabetes and support long ,lustrous hair. Formerly, I have shared this recipe with onions. But I wanted to try it without onion-garlic, so this is my Satvik version of the same. This year I have included at least one green in my daily diet. 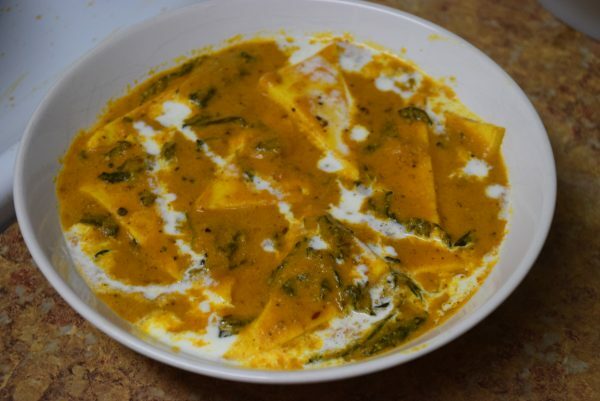 Since paneer is rich in proteins and fats, this dish in whole is a health-bonus. Moreover, my daughter relishes it . 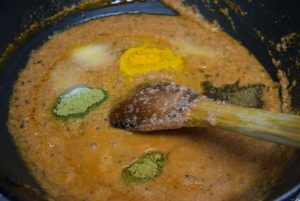 So let's check this delicious recipe now..
We begin with preparing the curry or gravy for this dish first. 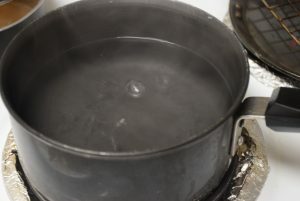 For this heat as much as 4 cups of water and bring it to a boil in a pan. In the meanwhile, soak the washed , plucked methiin water with 1 tsp salt . 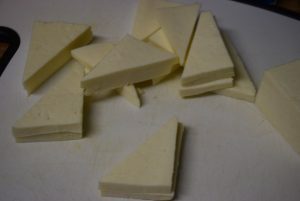 Also cut/slice the paneer in desired shapes. I sliced it in big triangles this time for a change. 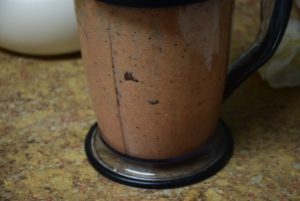 When the water starts boiling , add the washed tomatoes , the ginger and the cashews in it. Next is, we will dry roast the whole spices involved with poppy seeds and almond flour in the end. So for this, take a non-stick pan /wok (kadhai) and add laung, badi elaichi, tej patta, sabut dhania, chhoti elaichi,dalchini in it on medium heat. Stir them continously till they smell aromatic and change slight color. In the same wok, add the poppy seeds and stir them till they roast and start popping slightly. Lower the heat and add the almond flour and continue roasting till it turns fragrant. Allow the spices to cool a bit. 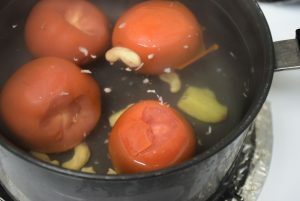 In the meanwhile, wash the boiled tomatoes ,ginger and cashews in cold water and remove the skin of the tomatoes. 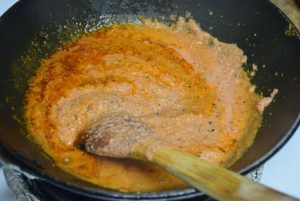 Now add the roasted spices, flour and boiled ingredients in a jar/mixer/blender and puree all till you get a fine paste. 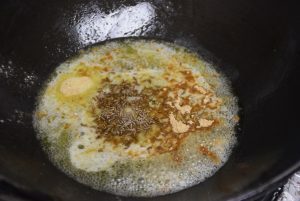 While the ingredients are blending, squeeze Methi from the saline water and add it to the heated wok containing oil. 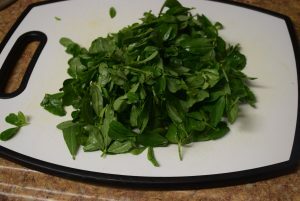 Roast methi on medium heat in oil till it withers and shrink in size. 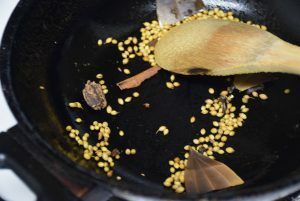 Once done, remove the roasted methi in a plate. 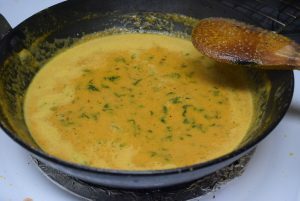 In the same wok(kadhai) , now add Amul butter on high heat. Once the butter starts melting, add jeera and hing to it. Also add soonth and stir them well. Lower the heat and add the puree just made to the wok. 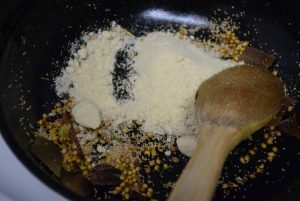 Also add kashmiri lal mirch powder and keep on stirring till all is mixed. Let it boil for 2 mins on medium to low heat. Now add the powdered spices viz. 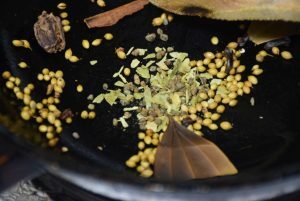 coriander powder, fennel powder,turmeric, salt and curry powder . Then add the roasted methi leaves and stir them in the gravy. Also add little water/milk if the mixture dries out. Bring it to a quick boil again. 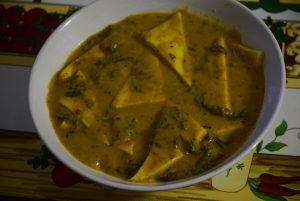 After this, add the big (almost equal thickness) triangles of paneer and allow it to cook for 2 mins. Now turn of the heat and cover it for another 2 mins. Once it is cooled to room temperature , serve it in a bowl and drizzle some fresh malai (preferable) or cream with a spoon on the top. 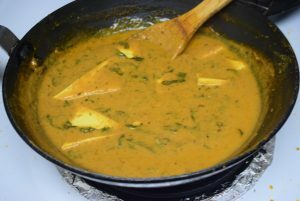 This entry was posted in Food, Kids- Favourite, Main Course, Recipes and tagged boiling the paste, Carenshare, delectable, delicious, Desi paneer, Downtown, Farmer's market, Fengreek leaves, garlic, great in taste, Haldiram's paneer, heavy whipping cream, home-made butter, home-made ghee, home-made paneer, light on stomach, Methi leaves, Methi malai paneer, most liked by readers, no garlic, no onions, not heavy on tummy, peculiar aroma, roasting spices, Saatvik, satvik, shweta jindal, soft triangles, special taste, sprouts, without garlic, without onion, Worth trying, yummy, zindagisikhati.